Mechanical Engineering Services: We offer specialized engineering services. Get more information on our mechanical engineering services. Architectural Services: We offer specialized engineering services. 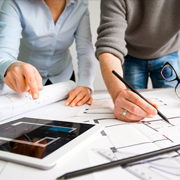 Get more information on our architectural services and sub-services. Civil Engineering Services: We offer specialized engineering services. Get more information on our civil engineering services and sub-services. Structural Engineering Design Services: We offer specialized engineering services. Get more information on our structural engineering design services. Electrical Engineering Services: We offer specialized engineering services. Get more information on our electrical engineering services and sub-services. Engineering Service Articles: Our engineering resources are comprehensive, informative, and well-researched. Check out our engineering service articles. How Can Augmented Reality Help Architects and Civil Engineers? How to Solve the Biggest Problems in Architectural Design with VR? Outsource2india is a time-tested outsourcing partner backed by over 20 years of expertise in providing outsourced architectural design and drafting services. Our expertise includes end to end design support on all areas of construction documentation. Our global experiences and ISO processes offer reliable, consistent, and high-quality results at competitive rates. O2I's team of qualified and experienced engineers provide custom designed commercial and residential architectural services. Our services include end-to-end solutions including CAD, CAD drafting, CAD conversion, architectural visualization, animated 3D walkthroughs and space planning, to name a few. Outsource2india has the expertise to create comprehensive construction documentation that can be used for analysis, planning, and execution. These designs are created to support builders and contractors involved in construction with sequential data of floor plan designs, elevations or reflected ceiling plans for the construction process. Outsource2india's 2D drafting services bring design to scale and dimension in domains like Aerospace, Automobile and Marine, Food processing, HVAC, Piping and ducting and Healthcare industries. Using software like AutoCAD, O2I can create 2D drafting and 2D drawings, convert 2D CAD to 3D and vice versa. We help manage design, configure changes and add geometric dimensions, tolerance information, associate notes, annotations and Bill of Material to engineering drawings. Our 2D CAD drafting solutions help real estate developers, engineers; consultants and architects reduce design and drafting time at cost-effective price. If you looking to moving from paper to digital for your architectural and mechanical drawings O2I offers CAD conversion services. CAD conversion and digitization makes archiving, retrieving, copying, editing and sharing drawings easier. We have been providing CAD Conversion Services for 20 years and are well-versed with standards and codes worldwide. Outsource2india's designers can draft concept and layout designs based on your space planning, construction documents and dimensions ensuring fast execution and substantial cost-savings. Our retail space planning services use an existing portfolio and draft concept designs that are compliant with all local and national codes and regulations. Outsource2india's interior designing services help your concept take shape in the real world and provide an interactive experience. We convert 2D CAD designs into 3D models and 3D renderings, 3D sectional views and 3D photo-hybrid-fusion of the 3D model with a photograph of the site, from different points of view, to create a virtual panorama. Outsource2india provides Millwork shop / Joinery drawing services for woodworking, metalwork and stonework companies. Based on submittal and manufacturing requirements, architectural millwork drawings are provided in DWG, .DXF, or .PDF formats based on your output and in-house drafting department standards to make the process of manufacturing simpler, accurate and effective. Outsource2india offers 3D rendering services that make presentations, models and animations come alive. Our 3D models carry detailed visuals with intricate detailing of texturing and light elements in commercial, residential and industrial environs. Partner with O2I and experience this dynamic medium, using computer-generated special effects for your presentation. Outsource2india's 3D Architectural Walkthrough services develop realistic 3D walkthrough models to help visualize constructions from different perspectives. If you are looking to close business deals, presenting work in 3D makes a difference. O2I provides 3D architectural walkthrough services for commercial buildings, industrial walkthroughs, 3D virtual art galleries and virtual room design services. Outsource2india can support you in creating compelling marketing and sales tools. Using landscape design and drafting services, you can present projects in the desired perspective. O2I offers clients master planning, site planning and design, site analysis and evaluation, project management, cost estimation which can ultimately help in the whole marketing processes. Outsource2india's has the technology and expertise to offer end-to-end BIM services. Our engineers use Autodesk Revit to design and have enabled construction and architectural companies to operate efficiently. BIM services help get a more holistic perspective on the project and being flexible and accommodating, changes at the design stage is possible. O2I works in collaboration with clients, design professionals, suppliers and building contractors making project planning and scheduling simpler and easier. Outsource2india's SketchUp Modeling services help create 3D models of your designs, architectural drawings and renderings and converting your ideas into reality. Backed by a creative team from fields like interior design, civil engineering, project management and other talented professionals sketch up modeling can help bring life to your 2D designs. At Outsource2india, we are a pioneer in providing point cloud services at extremely affordable rates. We provide top-quality services that precisely cater to your requirements and ensure that all your business requirements are clearly addressed. To provide our clients with the best-quality architectural engineering services, O2I has access to state-of-the-art infrastructure. We work on quad core processors, cloud based storage, along with high-security data back-up solutions to provide engineering services. We make use of some of the latest tools and technologies for providing quality engineering services, including AutoCAD, Inventor, SolidWorks, XSteel, 3D Studio Max, etc. In the world of architectural services, overheads can be significant. Personnel, computer systems, software, office space and drafting equipment require considerable investment by a company. To thrive in the business environment of today, companies must seek higher profits not only through increased sales, but also by reduced costing. Read an article on how to solve the biggest problems in architectural design with VR. Maximize your return on investment by enabling your designers and equipment in high end tasks and choose O2I for support design and drafting tasks to ensure efficiency and higher profits. Contact Outsource2india to outsource your Architectural Services requirements. Our engineering services have created global success stories.